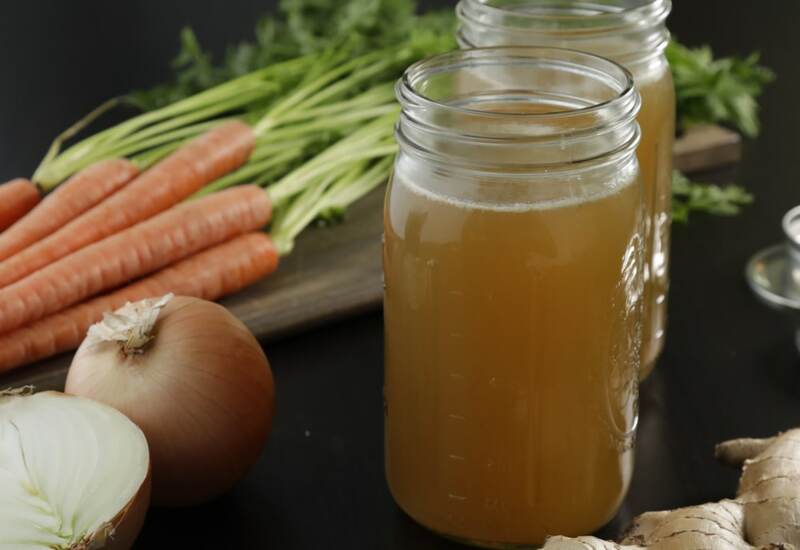 Bone broth has enjoyed a surge in popularity due to its association to the Paleo diet. If our Paleolithic ancestors had had a pressure cooker, they'd certainly have used this recipe to get nutritious, hearty bone broth for all their soup and stew needs. The longer you cook this, the richer it gets, so feel free to go long on this one! Because it's sealed in the pressure cooker, you don't even have to monitor the liquid levels. Bone broth can also be enjoyed as a hearty and healthy morning beverage. It is a great way to start your day because it is rich in minerals that support your immune system and contains healing compounds like collagen. Put carrot, onion, and ginger into your pressure cooker pot; top with beef bones. Pour water into the pot to cover ingredients completely; add vinegar. Select Pressure Cook (Manual) and cook for 120 minutes on High pressure. Once the cooking cycle has completed, allow pressure to release naturally for 20 minutes, then set steam vent to Venting to quick-release remaining pressure. Strain liquid through a fine-mesh strainer. Let broth cool completely. Skim fat from the surface and discard. Keep stock refrigerated in sealable containers for up to 7 days. Beef knuckles are ideal for making bone broth due to the high gelatin content, but you can use whatever you have available. A classic bone broth is made with bones and cuts of meat high in collagen, like marrow, knuckles, and feet. Beef bones are most typically associated with bone broth, but it can also be made with lamb, pork, chicken, or veal. Per Serving: 423 calories; 28g fat; 2.4g carbohydrates; 38g protein; 123mg cholesterol; 96mg sodium. I added some veal bones to this recipe as well, a trick my mom used anytime she was making beef bone broth. Great recipe and congeals perfectly. This was first time making bone broth and it was a lot simpler than I thought. I went on a hunt to find the bones, and eventually found beef knucklebones in the frozen section of the store. Eight cups of water was plenty. I ended up storing some in the fridge and freezing the rest. I added a mixture of chicken and pork bones from the freezer also. This is a great bone broth to make in the pressure cooker and it takes 1/3 of the time it would normally take me to make bone broth on the stove! Perfect beef bone broth recipe! I added one more tablespoon of ACV for good health. You can also add more veggies if you like, but not really necessary. This has so much flavor, it's a must try. I cooked mine for 4 hours and it was very rich. Thanks for that tip! I'm going to start drinking this regularly and I'm so excited to see the results.